It had been a year since he had traveled from the kingdom of death and demons. Looking back at the plain hills around him with sharp coral, he had the hood of his jacket up, to keep the sun away from himself. It would have been more helpful if he didn't have a little girl sitting on his backpack but he didn't mind her. Smiling a little to himself, the young man thought back to the day he had come across the tiny fairy. She was trapped by the ankle, so he helped her not knowing he would have her with him for...probably forever. Shaking his head to clear his mind of the memory, he snuck a peek over his shoulder at his travel buddy to check on her. Looking ahead once again as he felt her move. Sitting on the tanned burlap backpack, the lavender fairy looked up at the sky, then to her partner. Smiling happily to herself, she was humming a soft and happy tune as they traveled farther. She was concerned with her friend though; she knew he must be having troubles in the sunlight. So, being careful as her friend walked, she crawled slowly to his shoulder before sitting down and holding on to his sleeve. Thinking about it again, she scooted her legs under the backpack strap, making herself a belt and continued humming once more on the trip. Aizaela had just left Seiryu City, and she was on her way towards the next kingdom. She got a few words of advice saying that the best way to get to the next kingdom was through the Satori Forest. She was currently in the Shikome Hills wandering trying to find a high point to survey the green land around her. Her long red hair brushed through the wind and she inhaled the nice fresh air. She soon thought back to her family and smiled. She was finally off. Aizaela was delaying what should have been done long ago. Walking along, she found a tall hill that would give her a great view point. She knew that there were going to be demons and monsters lurking, but she didn't know when. Alas, Aizaela continued to head towards the hill. She then noticed a figure in the distance and gave a small quiet glee. This was a chance to see if this person could help her. Aizaela increased her walking speed to meet the figure. She was excited to talk to supposed traveler. As soon as Aizaela could make out some details of the figure, she could see he was carrying possible belongings and a hood jacket. It was odd for someone to be wearing a hooded jacket when the sun was out. Perhaps it was to hide his identity. Aizaela had multiple thoughts running through her head and she was getting closer to the figure with each step. Any confusion would be no more once she approaches. The tall, lean-muscled young man in the hooded coat slowed to a graceful stop when a strange scent caught his attention. Pondering silently, he denoted that it wasn't human. Frowning slightly, he looked to the fairy on his shoulder quietly. "Someone is approaching," he whispered to his little friend. "Could you go look?" He could "see" with his other senses but he wished not to use them at the moment and he knew Lavender would want to see whatever was approaching. The tiny girl with wings like a dragonfly smiled at her companion's request. She was also curious as to why her savior had stopped. So, quietly shifting her legs from under the backpack strap, the little fairy started crawling to the other shoulder. From afar, she might just look like a silvery-blue light in the sun on the hooded man's shoulder. Peering out over the hills, her silvery-blue eyes caught sight of a smaller person, though much bigger than herself. Giggling softly, she stood carefully on Alphinon's shoulder and whispered in his ear lightly. "It's a girl, and she's headed our way," She said and sat back down, happy as can be as she played with her cornflower blue hair patiently. Alphinon's frown deepened as he heard what, or rather, who was approaching. A girl? He thought to himself, why would a girl be approaching them. Then thinking about it again, he guessed he did seem out of place with a hooded coat on a sunny day. 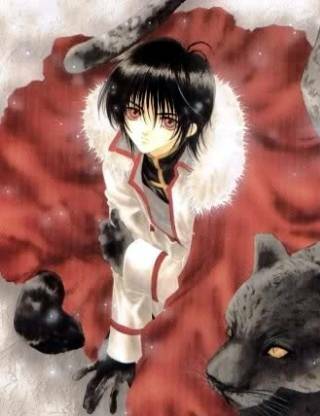 Feeling a little lightheaded, he growled softly and began walking once again without glancing at the young woman. If she chose to follow, then he would not stop her. Though he speculated that it was unpredictable, he reminded himself that he wasn't in Akuma Kingdom anymore; death was less common in Futami, so he would have to be careful.